Are you new to blogger blog or already an old user, it is very important to note that good flowing traffic is Paramount. That is, the more traffic you get, the more your blog or site grow in earnings, and many more... So in essence, traffic is very necessary when you talk about blogging. For one's blog to grow in high traffic, there are things which are required of such blogger to do in other to skyrocket his or her blog traffic. Some of those things are; optimizing the blog for SEO, maximum utilization of social media like facebook, twitter, instagram, whatsapp, Google plus etc and so on. However, when you finally get this traffic to your blog, in other to keep the traffic steady to your blogger blog or that of your WordPress blog, and also to keep the bounce rate of the blog normal, there are tools or widgets needed to carry such works out. The widgets needed for such task to be carried out are as follows: popular post widget, recent post widget, related post widget, email sign up forms etc. For this particular post, I will be guiding you on how to implement a Recent post widget to your blog with our very own recent post widget code. See: How To Increase Your Site Alexa Rank Globally Within Short Period. Latest Method On How To Block Low Paying CPC Adsense Ads. I believe you like the blogger recent post widget showing here at Techbmc, (see image below) In case you do, below is the detailed tutorial on how to get the cute widget installed to your blog in other to keep your traffic once you get them coming in. Follow the guide meticulously as stated below. ==&gt;3. Now, on your dashboard, Click "Layout" and you will see where "Add a Gadget" is located at the sidebar, just locate the particular side bar you wish to add the recent post widget to, and then click on "Add a Gadget" on top of it. ==&gt;5. Next, a box will appear after clicking "HTML/JavaScrip" now, on the first small box for title, write Recent Post, then copy and paste the below provided code into the content area (that is, the big box) and click on "Save"
==&gt;6. 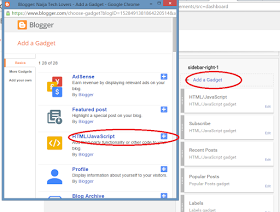 That's all, visit your blog homepage and view how the recent post widget is showing. Hey trust me, your blog readers will commend you for this because, it makes them get to your post easily. And for those new visitors to your blog, this will surely fascinate them thereby making them to jump into your blogger blog pages and articles. kindly do others the favor of getting this tips by sharing this post.